The battle over the Confederate flag spread from the South Carolina Statehouse to the United States’ biggest retailers. Other states are moving to remove Civil War-era symbols from capitol buildings, license plates and other government-owned locations. On Tuesday, the country’s retail giants began pulling Confederate items from their physical and virtual shelves, a day after Gov. Nikki Haley (R-South Carolina) called on the state legislature to remove the Civil War-era flag ‒ one which never served as the official flag of the Confederate States of America ‒ from the capitol grounds. It was a momentous step in a decades-old controversy on the presence of the Confederate flag on state property, and it took a mass shooting by a man who cloaked himself in that flag for there to be any movement… and retailers like Walmart, Amazon, eBay and more took notice. Less than a week after nine people were killed in a shooting spree at Emanuel African Methodist Episcopal (AME) Church in Charleston, South Carolina, retailers began pulling Confederate flag items from their wares. Dylann Storm Roof ‒ the 21-year-old who confessed to the killings ‒ had posed with the Confederate flag in photos posted on social media. "We never want to offend anyone with the products that we offer. We have taken steps to remove all items promoting the confederate flag from our assortment ‒ whether in our stores or on our web site," Walmart spokesman Brian Nick said in a statement. "We have a process in place to help lead us to the right decisions when it comes to the merchandise we sell. Still, at times, items make their way into our assortment improperly ‒ this is one of those instances." Johnna Hoff, an eBay spokesperson, said the Confederate flag will no longer be sold in its online auctions. "We have decided to prohibit Confederate flags, and many items containing this image, because we believe it has become a contemporary symbol of divisiveness and racism," Hoff said in a statement. Sears, which operates Sears and Kmart stores, does not sell Confederate flags, but will remove such merchandise sold by third parties from its online marketplace, spokesman Chris Brathwaite said in a statement. “We are in the process of scrubbing our marketplace to pull those items down,” Brathwaite said. Target pulled a Confederate uniform costume from its website after receiving questions from CNBC. "Our intention is never to offend. We all recognize the great sensitivity around this and have removed the item from our website," a company spokeswoman later told CNBC. "Etsy's policies prohibit items or listings that promote, support or glorify hatred and these items fall squarely into that category," spokeswoman Sara Cohen told USA Today. The decision to stop selling items harkening back to the Confederacy is likely a business decision for most of the companies, and less of a move towards corporate responsibility. "Retailers are looking at the landscape of their customers and feel like they want to get out in front of this," Ed Fox, a retail marketing professor at Southern Methodist University's Cox School of Business, told CNBC. "They are sensing that the tide has quite literally turned in the face of the violence in Charleston." Sales for Confederate flag and related merchandise spiked on Tuesday, with five of the top six ranked items in the patio, lawn & garden category of Amazon Movers & Shakers being Confederate flags. The number two item, which can no longer be purchased, shot up 8,800 percent from the 178th spot over 24 hours. "Of course sales go up when people are talking about it. That much is true with any flag, the same happened with the US flag in 2001," David Simpson, who works at Ruffin Flag Company, told CNBC. Despite the meteoric rise in sales of Confederate-related items on Amazon, flag makers say that the market for Confederate flags isn’t that great. "It's not something regularly produced," Reggie Vandenbosch, chairman of the Flag Manufacturers Association of America, told USA Today. "It's not even a tenth of a percent of the overall business." The association has plans to discuss whether or not to continue manufacturing the flag, but Valley Forge Flag, where Vandenbosch is vice president of sales, plans to stop selling it, he said. "There's been a sea change moment out there and the issue has really come to light," he noted. "We're just simply not going to participate in production or selling of these out of sensitivity and not wanting to create anybody any additional emotional pain." Dr. Michael Landis, a Civil War scholar and an assistant professor of history at Tarleton State University in Texas, says that the Confederate flag has been misappropriated to mean Southern heritage when it really was about slavery. 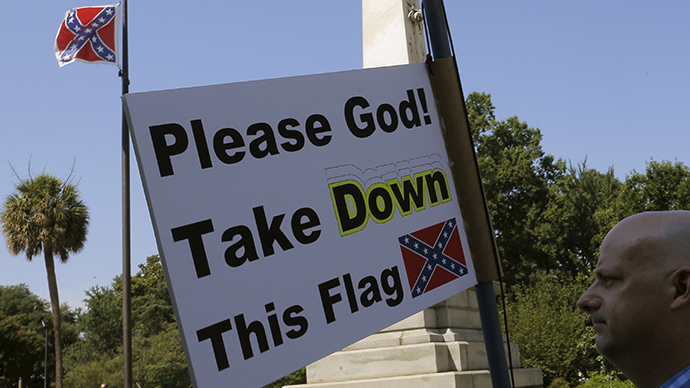 "The problem today with the Confederate flag is that people take it out of context. The flag symbolizes an attempt to form an independent nation based on white supremacy and black slavery,” Landis told the Stephenville Empire-Tribune. "It was not until after the Civil War that white Southerners began to claim that the war was not over slavery and that the Confederate flag was about 'heritage’." "There was a deliberate effort to clean-up Southern history and replace slavery with 'states' rights;' slave-owners with 'southern belles;' etc.,” Landis added. “This deliberate destruction of the truth is what we live with today -- generations of white Americans have been brought up with the false version of Southern history and now infuriated when presented with evidence to the contrary." In Richmond, Virginia Governor Terry McAuliffe, a Democrat, ordered the removal of the Confederate flag from official state license plates, citing last week’s Supreme Court decision allowing Texas to ban the flag on its state license plates. Tennessee Gov. Bill Haslam, a Republican, said he would like the Confederate flag removed from the Volunteer State’s license plates, as well as the bust of Ku Klux Klan founder Nathan Bedford Forest removed from the Tennessee statehouse, USA Today reported. Similar calls are being heard in Mississippi, with at least one top Republican lawmaker calling for a change to the official flag, which still bears a reference to the state’s Confederate past. However, Mississippi’s Republican Governor Phil Bryant pointed to a 2001 referendum in the state in which nearly two-thirds of voters opted to keep the Confederate symbol in the state flag, the design of which has been in use since 1894. “I don’t believe the Mississippi legislature will act to supersede the will of the people on this issue,” he said Monday, according to the Clarion-Ledger.